For the album of the same title, see The Johnny Cash Show (album). The Johnny Cash Show was an American television music variety show hosted by Johnny Cash. The Screen Gems 58-episode series ran from June 7, 1969 to March 31, 1971 on ABC; it was taped at the Ryman Auditorium in Nashville, Tennessee. The show reached No. 17 in the Nielsen ratings in 1970. Cash opened each show, invariably preceding the first number with his customary "Hello, I'm Johnny Cash" greeting, and its regulars included members of his touring troupe, June Carter Cash (his wife) and the Carter Family, The Statler Brothers, Carl Perkins, and The Tennessee Three, with Australian-born musical director-arranger-conductor Bill Walker. The Statler Brothers performed brief comic interludes. An instrumental version of "Folsom Prison Blues" was used for the opening credits. It featured many folk-country musicians, such as Joni Mitchell, Bob Dylan, Linda Ronstadt, Kris Kristofferson, Mickey Newbury, Neil Young, Gordon Lightfoot, Merle Haggard, James Taylor and Tammy Wynette. It also featured other musicians such as jazz great Louis Armstrong, who died eight months after appearing on the show. 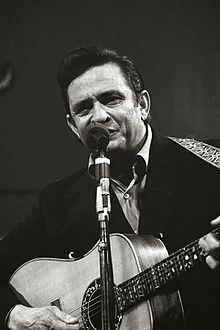 Cash had been approached by ABC to host a television show after the major success of his two live prison albums, At Folsom Prison and At San Quentin.The show started with an hour-long tryout offered by ABC as "a summer replacement for its Saturday night variety extravaganza The Hollywood Palace." While Cash had a large degree of freedom, he "had to accept some compromises by hosting showbiz royalty like Bob Hope, George Gobel, Kirk Douglas, Burl Ives, Peggy Lee and Lorne Greene. They gave the show gravitas that satisfied both advertisers and the network". The show was recorded at Nashville's Ryman Auditorium, then home of the Grand Ole Opry. The show was conceived by Bill Carruthers, who also served as executive producer and director for the first season. Stan Jacobson was also a producer on the show. Myles Harmon was the program executive for ABC Television. The first show featured Joni Mitchell, Cajun fiddler Doug Kershaw, Fannie Flagg as a comic, and Bob Dylan. The show included a "Country Gold" segment which featured legends rarely or never seen on network TV such as Bill Monroe and his Blue Grass Boys. Author Rich Kienzle suggests that as well as providing entertainment, the show operated as a "Country Music 101". Cash persisted in the face of ABC "network anxieties" on several occasions. He refused to cut the word "stoned" from Kris Kristofferson's "Sunday Morning Coming Down", he stood by his Christian faith "despite network anxieties", and persisted in bringing on Pete Seeger whose anti-Vietnam War song on another network had "caused a firestorm". He premiered his "Man in Black" song on an episode taped at Nashville's Vanderbilt University campus. In 1970, Columbia Records released The Johnny Cash Show, a live album, as a tie-in with the TV series, though the record is not considered a soundtrack. The release is unusual as Columbia was affiliated with competing network CBS. Cash's version of Kris Kristofferson's "Sunday Morning Coming Down", included on the series, is included on the album and was released as a single, which was a major hit for Cash. One unusual taping occurred in 1971. Cash began the program assuming it was a regular episode. Moments after Cash greeted the audience, June Carter Cash came on stage and said she had a special guest. Ralph Edwards then joined the two on stage; as the audience erupted in a standing ovation, Cash realized that it was actually a taping for an installment of This is Your Life honoring him. The show was canceled in 1971 in response to the Prime Time Access Rule, which eliminated a half-hour of network prime time programming from all of the major networks' nightly schedules. Cash's show was one of many that had strong rural followings that were canceled across the networks in what came to be known as the "rural purge." In 1976, CBS ran a revival of the show, Johnny Cash and Friends, as a replacement series for four weeks from August 29 to September 20, 1976. The new show was taped at the newly constructed Grand Ole Opry House in Nashville. Aside from musical performances, this series also featured a greater emphasis on comedy, with Steve Martin and Jim Varney appearing as regulars, and with June Carter Cash performing several comedy routines as "Aunt Polly" (reviving a character she had performed early in her career). Following Johnny Cash and Friends, an annual Johnny Cash Christmas Special series was launched, starting in 1976, with specials airing almost every year until 1985. A DVD set featuring 66 live performances from the show, called The Best of The Johnny Cash TV Show, was released in Region 1 on September 18, 2007. The DVD set was hosted by Kris Kristofferson and directed by Michael B. Borofsky, and was produced by Reverse Angle Productions for Sony Pictures Entertainment and Legacy Recordings, Sony Music Entertainment's catalog division. An accompanying CD, featuring selected numbers from the show (some of them not on the DVD set), was also released. From season 1, episode 1, originally aired 7. June 1969. From season 2, episode 6, originally aired 28. October 1970. From season 2, episode 8, originally aired 11. November 1970. From season 1, episode 15, originally aired 27. September 1969. From season 2, episode 17, originally aired 28. January 1971. From season 1, episode 17, originally aired 28. January 1970. From season 2, episode 20, originally aired 17. February 1971. From season 1, episode 6, originally aired 19. July 1969. From season 2, episode 14, originally aired 6. January 1971. From season 1, episode 30, originally aired 29. April 1970. From season 2, episode 10, originally aired 25. November 1970. From season 2, episode 16, originally aired 21. January 1971. Cash, Johnny; Carr, Patrick (1997). Cash: The Autobiography (1st ed.). New York, NY: Harper San Francisco. p. 58. ISBN 0-06-072753-5. ^ "The Johnny Cash Show". TVGuide.com. ^ "Johnny Cash series ready". Ocala Star-Banner TV Week. August 27, 1976. p. 39.